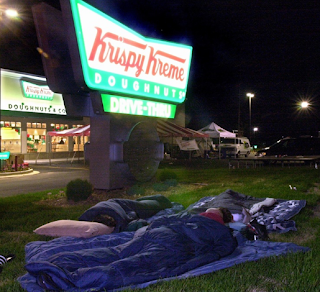 Have received a report that three folks are already in line at Krispy Kreme for tomorrow's 6AM opening. It doesn't look like my plan of getting there fifteen minutes ahead of time, per my normal commute, to be one of the first fifty is going to work. Folks in line might also want to check the weather. I think there's a line of thunderstorms on the way that is supposed to hit late tonight, early tomorrow.